I was so thrilled when Jessica of Chronically Vintage – who so many of you will already know and love – suggested we work together on this post in aid of her Etsy shop, ChronicallyVintage. 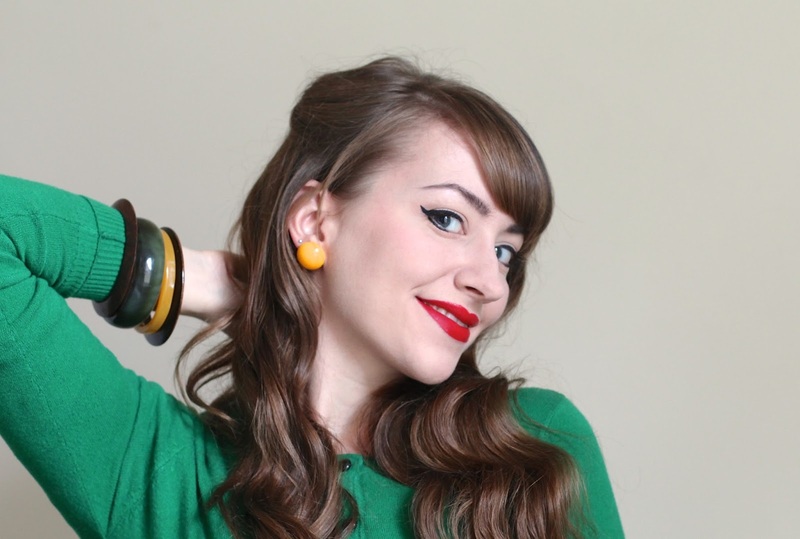 This lady is so tireless in her support of others in the vintage community generally and she’s been such a caring friend of mine in particular, I leapt at the chance to feature her awesome shop here. It surprised me to learn that Jessica suspects many of her readers aren’t aware that she has a shop, or come to learn about it after some time of reading her blog. I can only think this is due to her mindfulness of never ‘sales-pitching’ her readers, which is incredibly admirable as it comes from a sincere place of wanting to provide the best content at all times. 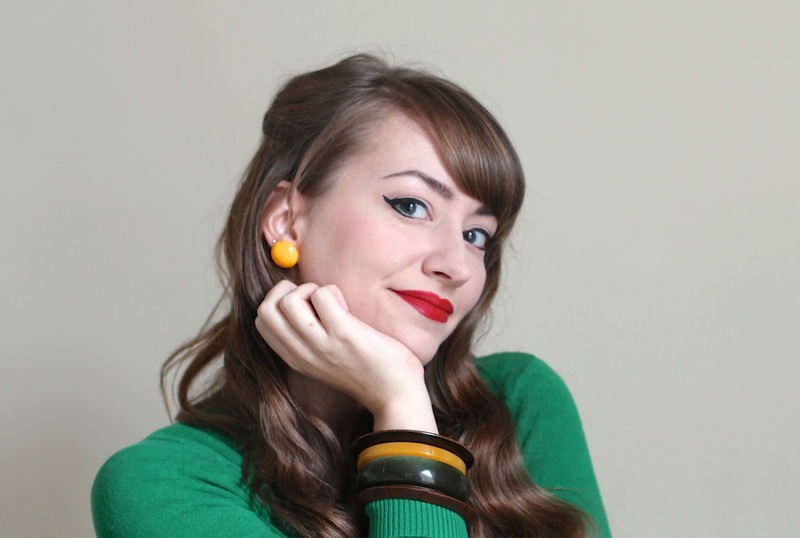 I, however, have no such qualms – Jessica works tirelessly to source and list cute vintage pieces with particularly fab ranges of jewellery and scarves and everything is very reasonably priced too. Incredibly, she’s got well over 1,000 items listed currently – a huge range for any vintage shop, but all the more impressive for a one-woman operation! Her shop specialises in accessories as that’s largely what’s available in her part of the world – you will find the odd piece of clothing and certainly bags too though. But anyway, I don’t need to tell you about how much is on offer, as much as I’m enjoying myself (what can I say, I’m a marketer by day), when I can show you a snapshot! All beautifully wrapped and securely packaged, as you can see. I’d like to add that Jessica had told me she’d send some things and asked for some of my preferences to pick them out – but I had no idea that she’d be this generous! It was one of the best mail days of my life, let me tell you! This picture above neatly demonstrates the immense care she puts into everything, even wrapping the smallest gift box – and you can’t even see how secure everything was padded on the inside, but believe me it was. And we all want that from a vintage seller, right? Now let me be frank, I am an abysmal accessory wearer. By abysmal, I mean incredibly lazy. Ok, I’ve got a few bags and hats now, but I don’t really buy jewellery and don’t wear what I do have enough – although I’ve been slightly changing my bad attitude starting with brooches this year (hence the odd one or two have been popping up here lately). Two years ago, I didn’t own a single brooch! The worst sin, though, is that I have 9 holes pierced in my ears and yet I wear the same 9 earrings all the time. I know, why did I even bother? The good news is that since this package of joy arrived I am changing my bad ways! And the biggest change has been with earrings – Jessica sent me so many cute pairs that I had to up my ear decor game rapidly. And I have to say, I am really enjoying it so far – and so much more than I thought I would! Anyway, you’ll be seeing lots more of these pieces in the near future in upcoming outfit posts, so meanwhile what you all want to know is how you can have your own mini collection from Jessica’s shop too, right? I might just be able to help you with that, as Jessica has kindly offered to giveaway $75 (USD) store credit – roundabout £50 – to one lucky winner, which could buy you very many treats (this credit can be used to pay shipping and taxes incurred at checkout, the latter only applying if you’re in Canada). Enter using the Rafflecopter widget below and I’ll pick a winner at random in a week’s time (and all the terms of the prize are found via the widget). And if you don’t win, or don’t want to take your chances, or really want to snap up something you’ve got your eye on before the winner snaffles it, Jessica has kindly also offered my readers 25% off all items in her shop via the discount code CiCi25 valid until 10 December 2015. This code will apply to the total before shipping (and taxes if you’re in Canada), there’s no minimum order value and Jessica’s determination to offer low combined shipping costs means that should Etsy’s calculations overcharge for this, she will refund differences of over $1.00 post-purchase. Finally, if you haven’t already, do enter Jessica’s Vintage Secret Santa – if you buy your gift from her shop (use the code, use the code!) and drop her a note she will even gift wrap it and throw in a holiday gift card for your lucky giftee. 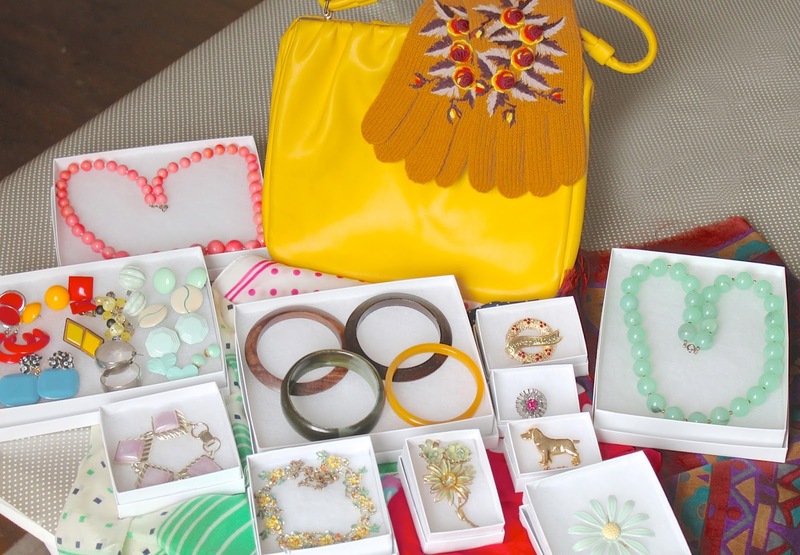 The packaging is so lovely, and Jessica chose some absolutely gorgeous pieces for you! 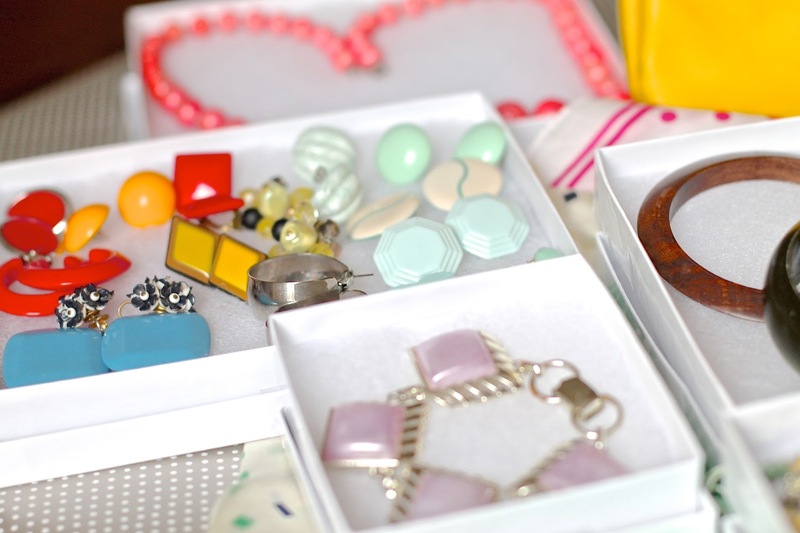 I'm just the same with accessories – I own plenty but always forget or am too lazy to change them up. 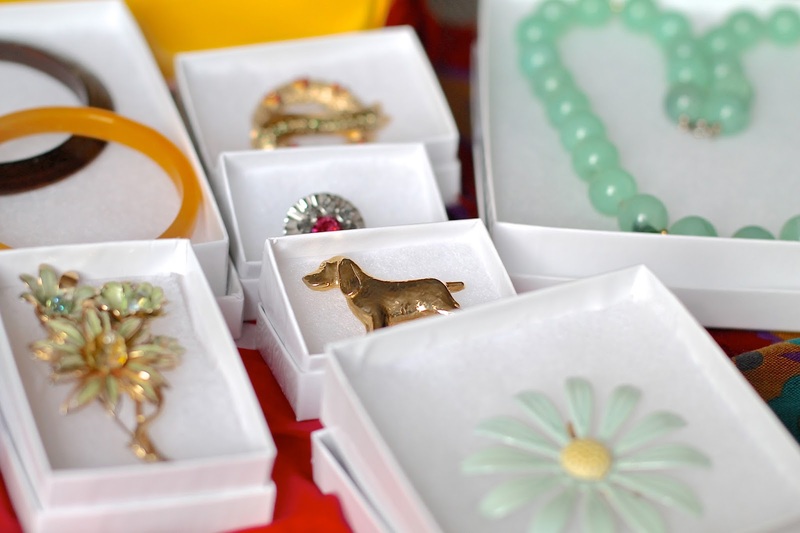 I also plan to focus on brooches too – I spotted some beautiful ones in an antique shop recently and am planning a return trip to purchase a few! She really did 🙂 I never realised how good value vintage brooches can be – definitely a good way to start embracing accessories. Oh my goodness, Christmas came early!!! I really love you in earrings, you suit them, and what a fab selection you now have. Jessica is just so lovely, what a generous lady. You are going to be accessorizing fabulously over the next few months, I look forward to seeing all of these items pop up in blog posts. There's some great stuff in her shop at the moment too, though I am sad the 1930s black and white slip gown thing is an XS, and I'm most definitely a M-L. Sigh. Just in case the lovely pictures of this post weren't enough, I have just come back from a browse around CronicallyVintage Etsy shop… WOW! Now I REALLY want to enter the giveaway! That necklace is gorgeous and looks lovely on you. I can't wait to see option c featuring The Necklace… If its anything as good as a and b it will make the choice even harder! So glad to bring it to your attention 🙂 Option c is coming together – the dress is now here and it's beautiful… I think it's going to be c! That's so lovely to hear 🙂 So sorry that your condition has meant you can't treat yourself as much – fingers crossed the bills will be paid off soon so you can. Jessica certainly has tonnes of bargains! What a great selection! Jessica has chosen well for you. Now you have no excuse not to be perfectly accessorised for every occasion. Wow! Such amazing looking accessories! I love the necklaces the most. I can't wait to see you in them! I actually discovered her only recently through your blog! I have my eye on some gloves on there, her shop is so extensive. I love the colours in what you've received, it's perfect. Hooray, that's good to hear 🙂 she finds some amazing gloves! There's just so much to choose from, it's so difficult! I love Jessica's blog AND her shop, and I have to agree that her prices are super reasonable, quickly shipped, and so lovingly packaged. I always have some of her things favorited on etsy, and I'd love to put that $75 to use! They really are – glad you agree. I'm so in awe of what she does and I'm glad to hear there's others out there that are fans too! Wow it's all so gorgeous! I especially love the headband with the earrings!! Sweet CiCi, thank you from the bottom of my heart for what is truly one of the sweetest, kindest and by far more touching write ups anyone has ever penned about me (and my Etsy shop). I can't begin to adequately convey just how incredibly moved I am by everything that you said and how elated I feel that you're pleased as much with your surprise presents. You've styled the ones highlighted here superbly and really given them your own stunning stamp of stylistic approval. It was – and is – a joy to team up with you and to offer one lucky blog reader of yours the chance to score a $75.00 store credit to my shop. This is an awesome collaboration and again, with all my heart, thank you so much for holding it! And, to all of CiCi's fabulous readers, thank you as well for beyond making my day with your terrifically nice comments and compliment. Giant hugs and best of luck to everyone!!! What a lovely selection of things to receive! Good going on the earring wearing. I bought a couple of pairs or earrings and some knitting patterns from Jessica a few weeks ago. It arrived so beautifully packaged, it was a great post day. Going to visit her shop again right now! Yay, glad to hear of a fellow Jessica shop fan! The packaging is lovely indeed. What gorgeous packaging! I've been thinking about investing in some of Jessica's jewellery for a while, but the discount code definitely seals the deal. I know, it's gorgeous right?! I told Jessica I loved the colour mustard and I'm absolutely thrilled with this little gem. I love reading both of you ladies' blogs and Jessicas shop is a treasure trove for vintage brooches. It sure is 🙂 great to hear from you, Melanie! I love Jessica's Etsy shop (and blog!) and have had it saved as a favourite for a while now. I was really tempted by a gorgeous pair of purple suede gloves but just knew they'd be too small for me. Will definitely add you to my reader in WordPress so I can follow you there! And thank you for adding me! That necklace is divine! It caught my eye straight away. I can hardly wait to see dress C, though your stripped Audrey inspiration is super cute! I thoroughly enjoy reading Jessica's posts, though hardly ever comment. She is a delightful writer. The red earrings look really nice on you! I hope you continue to wear strong colors in jewelry because it shows off your pretty face. That's such a lovely comment, thank you! I'm definitely growing more used to 'statement' earrings – there's no denying they're not fun to wear. Ah, these accessories are all so lovely! I do need to accessorize more, and what better way to do it than with Jessica's lovely selection? What an awesome giveaway! I love seeing two of my favorite bloggers paired up for something so fun. I'm crossing all of my fingers and toes because I'd love to win! Glad you like it! Good luck!! So excited! I do "know" Jessica and follow her on all platforms and joined in on the secret Santa…and now have a code too…yippee! What a great collaboration! You're both awesome and thanks for the fun giveaway.